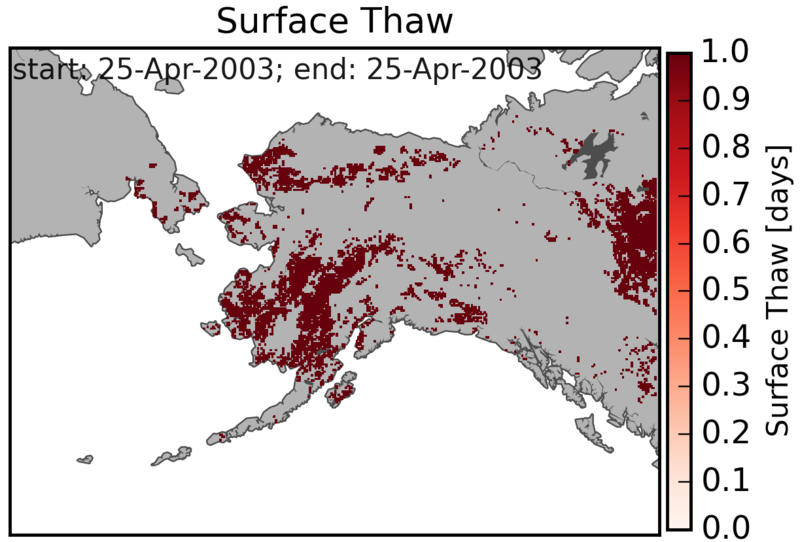 Surface thaw map for Alaska and Northwest Canada on April 25, 2003, derived from the Advanced Microwave Scanning Radiometer (AMSR-E). A new dataset from NASA's Carbon in Arctic Reservoirs Vulnerability Experiment (CARVE) provides daily 10-km resolution maps of the Alaskan & Northwest Canada land surface state as either frozen, melting, or thawed. These data are generated from passive microwave radiometer observations made from 2003 through 2014 by the Advanced Microwave Scanning Radiometer (AMSR-E) and the Special Sensor Microwave Imager (SSM/I). CARVE is a NASA Earth Ventures Suborbital (EVS-1) investigation designed to quantify correlations between atmospheric and surface state variables for Alaskan terrestrial ecosystems through intensive seasonal aircraft campaigns, ground-based observations, and analysis sustained over a 5-year mission. CARVE science fills a critical gap in Earth science knowledge and satisfies high priority objectives across NASA’s Carbon Cycle and Ecosystems, Atmospheric Composition, and Climate Variability & Change focus areas as well as the Air Quality and Ecosystems elements of the Applied Sciences program. See all data from the CARVE mission.